It’s a tradition around the world for adventurers and vacationers to return home bearing gifts for loved ones. Red Pineapple on Oahu is the perfect stop for visitors to find unique, Hawaii stocking stuffers and jaw droppers for the holidays. And while Red Pineapple offers truly local products, Nalani also seeks out unique products from elsewhere. Alongside a selection of Adoboloco hot sauces made on Maui or Manoa Goat Milk Chocolate, you’ll find Vermont Smoke & Cure meats and jerkies, a generations-old operation that you kind of have to know about to know about. Red Pineapple’s products are not generally to be found next to big-box brand names. Red Pineapple offers unique Hawaii gift ideas. Here in Hawaii, we’re most familiar with the Japanese concept of omiyage. Simply put, it is the practice, or perhaps ritual, of returning with gifts from a journey to be presented to those we hold dear. It is a familiar gesture for anyone who travels far from home. It’s an obligation. It is why plastic Eiffel Towers and Statues of Liberty sell like hotcakes in Paris and New York City. But Red Pineapple is much more than a hawker of kitschy knick-knacks. Its inventory is carefully selected. The variety of snacks and goodies, bath and body products, baby goods, and artisanal arts and crafts reflect a commitment to supporting small business in Hawaii and abroad. Nalani Holliday seeks out the kinds of things she would herself give as gifts to those she herself holds close. Much of Red Pineapple’s success comes from the personal products and services. Nalani is particularly gifted in creating gift baskets for practically anything. Each year Red Pineapple creates corporate gift baskets to dozens of valued employees of esteemed local business institutions. Personalized thank-you gifts to wedding parties. Baby’s first birthday luau décor. Nalani is particularly gifted in the art of giving. Pikake flower-infused hand lotion? Sure. Candied sugar cane? You bet. Hand-etched bourbon tumblers with undulating octopi and cheeky witticisms? Red Pineapple has those, too. And why not put them all into a green-friendly tote bag designed by one of Hawaii’s many local artisans? Everything in Red Pineapple’s stores and featured on its website reflects something of Hawaii, even the Vermont Smoke & Cure products Nalani flies in. 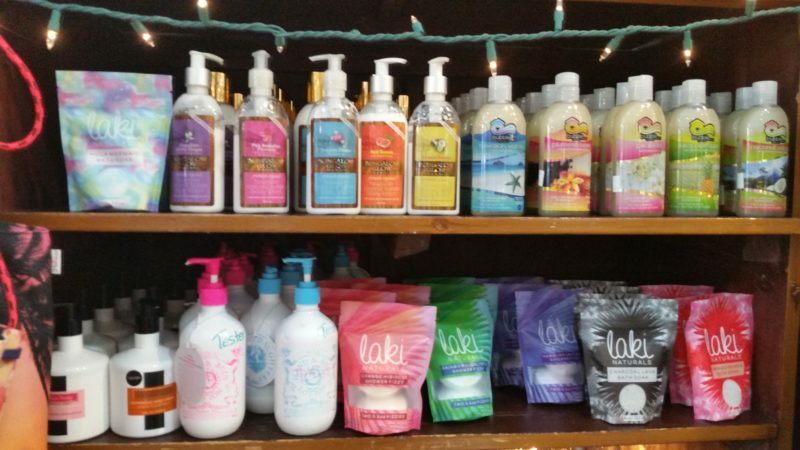 They are products that a local girl full of aloha would be happy to give to her own family and friends. It’s easy to grab a plastic ukulele for a snotty nephew from an ABC store, or a jar of macadamia nuts for the in-laws from the Duty Free store at the airport. But a gift from Red Pineapple has already been selected by Nalani for its genuine sense of caring and gift giving and connection to the Aloha State. Nalani’s commitment to spreading the Aloha Spirit is evident in her continued support of the Joyful Heart Foundation. It is a non-profit organization dedicated to assist women who have suffered acts of domestic violence and abuse. Oahu visitors looking to find the perfect Hawaii gifts for cherished family and friends can’t go wrong at Red Pineapple. It’s the perfect way to “keep it local” while supporting a small Hawaii business with the express purpose of supporting local business. 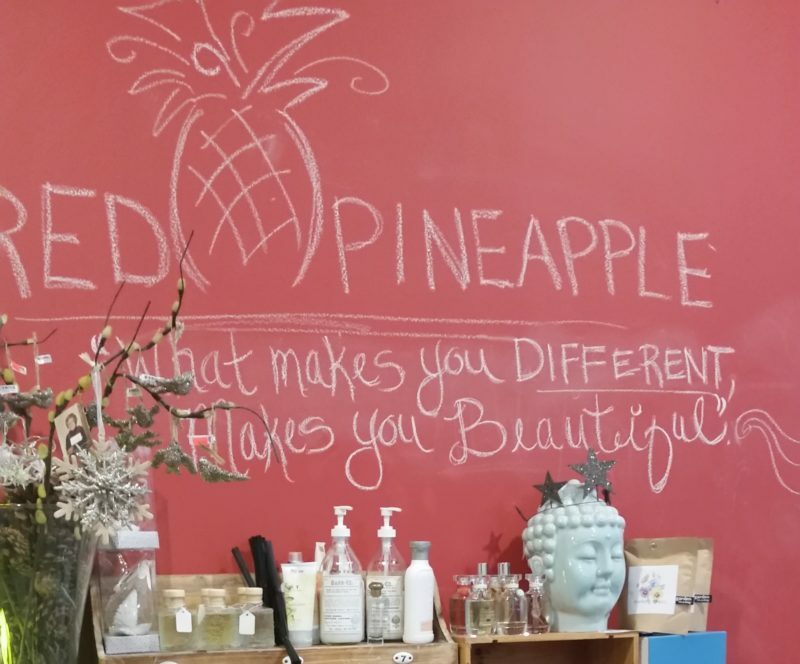 For more information about Red Pineapple’s products and locations, visit their website.